The Michael Snow Photo-Centric exhibit at the Philadelphia Museum of Art (available for viewing until April 27, 2014) is a retrospective collection of many of his images that explore the meaning of sequence and time. This post continues an essay on the Snow’s photographs I wrote earlier that explored the spatial compression of three-dimensional space in the two-dimensional plane of the photographic print. In “Authorization”, Snow has created a self-portrait as a sculptural relief by pasting Polaroid self-portraits on the mirror used as the reflective surface to produce the portraits. The mirror combines the deeper space visible in the reflected image at this moment in time (as the viewer looks at the work) and at the moment of exposure. The camera is not focused on the surface of the mirror, rather the lens is focused sharply on the image of the photographer making the exposure. He placed a Polaroid print of each subsequent exposure in a grid of four, one at a time, thereby eventually obscuring his own face and camera with out-of-focus images of his reflection. 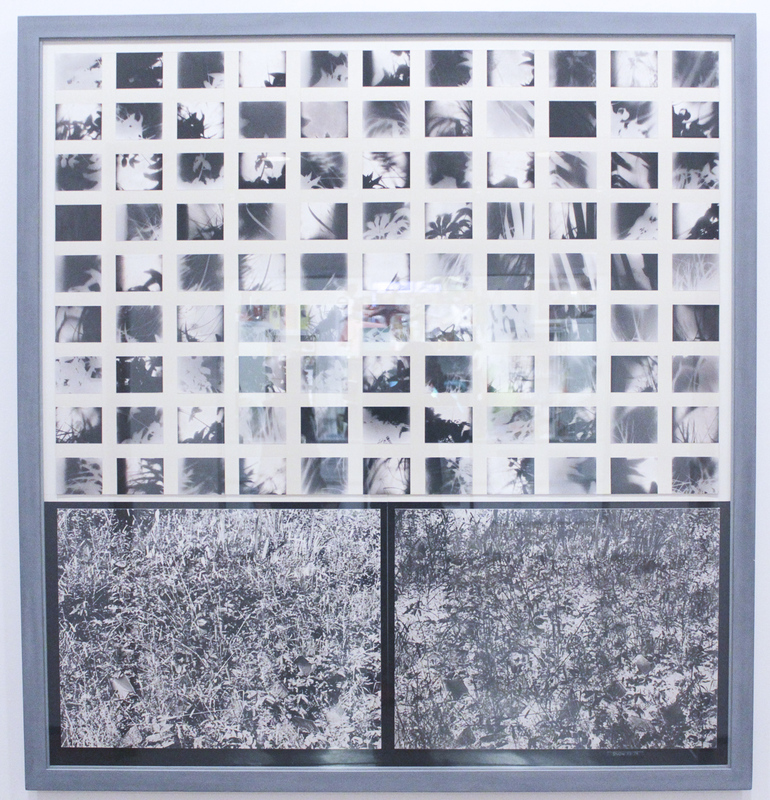 The final image, placed in the upper left corner of the mirror shows the four images as exposed, out of focus, with only the thin area of the background around the tape framing the grid as the only sharply focused element. Time in this photographic sculpture is re-recorded over and over as it is captured in the moments of each exposure in the sequence and the moment that it is viewed in the gallery. This is a mixed-media sculpture, not simply a photograph. To complicate matters further, the sculptural object that is the subject of the photographs is being created by the images of itself that are taped to it’s mirror surface. Overlaid are the other images that are being reflected in the mirror at this live moment in time – the photographer brings the viewer of his portrait into his portrait and photographic sequence. The viewer is also being invited to view the production process, since they can see the process of the self-portrait in the sequence taped to the mirror. In this sequence we see the artist erasing himself from the image. In the final photograph, which is shoved into the corner of the actual mirror on exhibit, the photographer has vanished into a generic gray blur. The title, “Authorization” is a reference to the process of authorship in art – in this case the author obliterates himself from what began as a self-portrait and is replaced by the faces of whoever is viewing the work. In addition, if others make a photograph of themselves in the mirror sculpture, then they are continuing the process started by the author and have themselves become authors. In some ways, Michael Snow’s work is like a visual lecture on the characteristics of photography and are often presented in a format that mimics a scientific poster minus the text. In “Field” we can observe two large photographs, a positive and a negative, of the same section of a grassy meadow and above a series of what appear to be abstract photographs of organic shapes laid out in a scientifically exact grid. The appearance is that of a number of different photographs, exposed at different times and places, but actually all the images in presented in the work were made at the exact same moment in time. Snow placed photographic paper randomly in the field of grass (clearly at night) then made an exposure with camera and flash of the photographic paper strewn across the field (these can be identified if you look closely at the large pair of images). The small prints are also in pairs of positive and negative prints of the same image. The process he used usually takes place in the darkroom: “photograms” are shadow prints of objects laid on the light sensitive photographic paper and exposed to an enlarger light in a darkroom and then processed in chemicals. Photograms are “lensless” since they are created by the shadow cast on the paper. In “Field”, Snow combines a photograph made with a lens and a number of images made simultaneously of the same location through direct contact with the photographic paper. It is a pretty fascinating image in the conceptual and visual sense, because it captures in one instant a photograph made from the level of the ground up through the light projected on to the paper from the flash of the camera and the image as captured by the film in camera. The pair of prints are enlarged from a very small negative, but the field photograms are the size as exposed, so there is an interesting comparison of scale in the work. Like the image of the mirror in “Authorization”, the process of making the image, becomes the image. He presents multiple perspectives of the same space and time made simultaneously. A momentin time isolated on to a piece of film or digital sensor has been a unique attribute of photography since its invention. This unique characteristic not only stops action faster than our eye can perceive, but it also can freeze a meaningful moment in human history. In both cases, the image is uniquely photographic but is only a partial representation of the truth of the moment. The historical image is given meaning by the social and cultural context in which it was made; it’s process of “authorization” begins at the moment of exposure and continues as others add on layers of interpretation and meaning. When action is “stopped” in an action photograph, that is an illusion since the movement at that time was fluid and seamless; our natural vision is not capable of isolating a fraction of a second. In “Authorization” and “Field”, Michael Snow reminds us that photography is a shadow of time.